Holiday is pleased to present Pictures, a solo-exhibition of recent work by Los Angeles-based artist Nick McPhail. McPhail’s practice sits at the precipice of painting, drawing, sculpture, and other more functional objects. His melding of styles and mediums sets forth a very California sensibility and seriality—bringing to mind work by artists like Peter Shire, Ken Price, or Helen Lundeberg. Through his disparate mediums McPhail’s forms follow. The lines from a sharp staircase in one painting become defused and washy in another landscape that is then completely redacted and abstracted in his much more minimal line paintings. 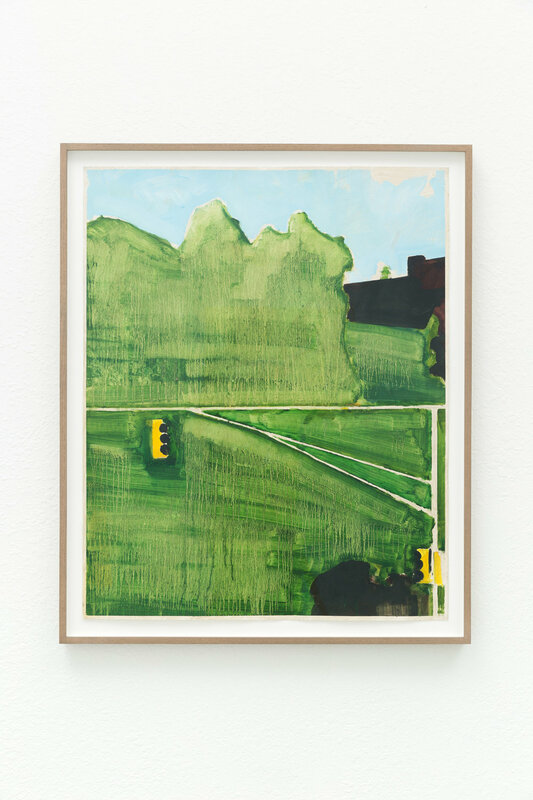 His subject matter is immediate—landscapes caught in a specific moment: apartment buildings from up the street in Silverlake; his grandmother’s driveway in Florida from a recent visit; or views through a window from his residency in Corsicana, TX. McPhail’s work act as a more contemporary exploration of history paintings but redacted of all figural signifiers and rendered in such a way that the landscape becomes the active agent. This immediacy in capturing what is so readily present follows in the repetition of lines in his panel works. Steadfastly done, the lines shift, bend, or break to create subtle patterns, all the while gestural brushstrokes are vividly present in the monochrome backgrounds. McPhail’s more figurative paintings appear as memories, washy and fading, while his line works are much more grounded—paintings that are at their core about the act of painting. This exhibition, which also marks the one-year anniversary of Holiday, will feature newly commissioned drinkware by McPhail as part of his ongoing project, Half Ceramics. McPhail’s functional objects follows a lineage of California ceramics that was so heavily cemented by artists mentioned before, such as Ken Price and his Happy’s Curios cabinets or Peter Shire and his endless exploration of the teapot. McPhail was born in Laingsburg, MI and currently lives and works in Los Angeles. Most recently he completed a residency in Corsicana, TX where most of the works in this exhibition were initiated. His work has previously been exhibited throughout Los Angeles, San Francisco, New York, and Michigan. McPhail is also the founder of Half Ceramics and Half Gallery LA, both based out of his Los Angeles studio. Holiday is open Sundays from 1-4pm and by appointment for the duration of this exhibition.